Bolivians in The Hague, united by the sea and separated by the referendum when we said NO to evo’s continuation! I am really happy and proud to have seen Bolivians protest against the delusional desire of evo to remain in power! Our claim to the world about the invasion of Chile to our territory is not been questioned anywhere at all. What infuriates me is thar evo and his acolytes, inside the Tribunal, too pictures with their political party salute … disgusting and a proof that his motivations are purely electoral! The above opinion is from Bolivian Thoughts. 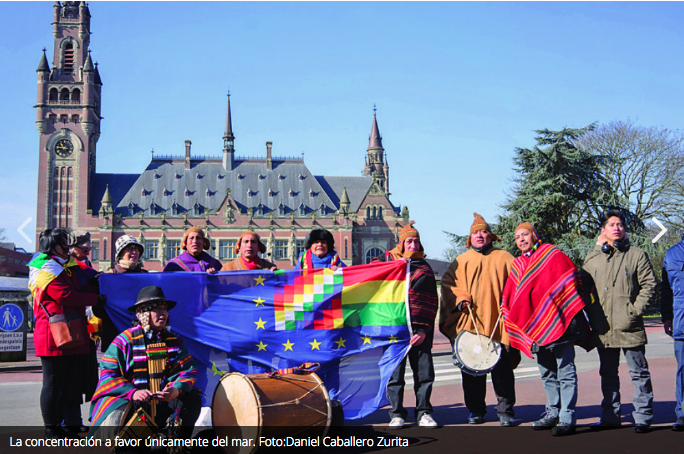 On the first day of oral arguments in the maritime claim of Bolivia against Chile in the International Court of Justice (CIJ), Bolivians based in different countries of Europe met in The Hague, the headquarters of that high tribunal of the United Nations, to support the country and defend the same cause: a sovereign exit to the sea. “We are so far from our country, but our heart beats with excitement, fighting together for that longing, for access to the sea,” said Beatriz, recently arrived from Belgium. However, this feeling in common was not enough to reunite Bolivians from different sides in the same place. MAS militants gathered in front of the International Court in The Hague, while 21F activists concentrated on Hoofplaats, in the center of the city. 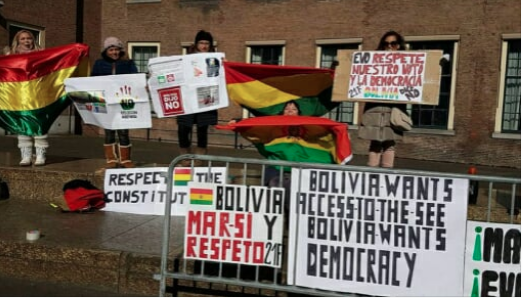 Taking advantage of the visit of the delegation of Bolivia, a group of Bolivian residents in the Netherlands launched a call to demonstrate in favor of maritime demand, but against the repostulation of President Evo Morales Ayma. “Bolivia wants sea and respect for its Constitution,” chanted some women demonstrators. After learning of this protest, Ivonne Van Pelt, representative of the Network Pro-Bolivia in Europe, made a complaint to the police, bewildered by the initiative. “Today I have a mixture of feelings, since we have seen a group of Bolivians against Bolivia and I can not explain that. “No march pro or against (of the Government) can influence the judges. 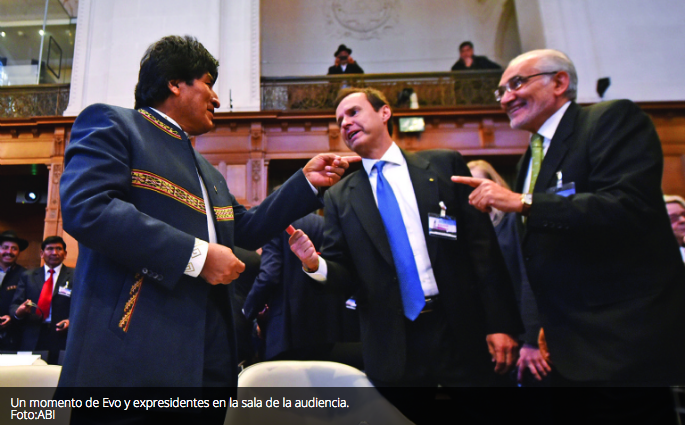 We are simply taking advantage of this opportunity to let the world know and repeat again that Bolivia said No,” she said. Despite the differences, no verbal crossings or incidents of any kind were recorded. There are thousands of Bolivians in many parts of the world who accompany us with our hearts and souls … that’s what we demand, the union of millions of Bolivian hearts,” said Gabriela Montaño, president of the Chamber of Deputies, outside the court. 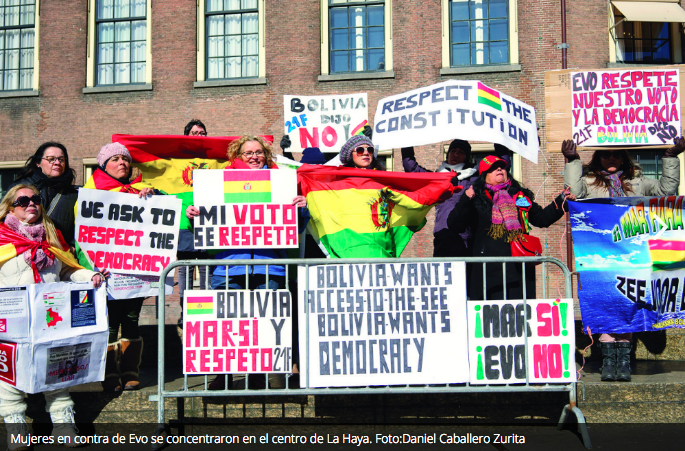 Respect, tolerance and hope were felt in The Hague, while Bolivians throughout the world chanted that Bolivia will soon have “again its sea, its sea”. This entry was posted in Bolivia, Politics, Social Unrest and tagged 1879 Pacific war, demagogue, democracy in peril, International Court of Justice in The Hague, invasion. Bookmark the permalink.